We will be visiting Untiedt Vegetable Farm near Montrose, Len Bush Roses near Plymouth, Big River Farms (which works with immigrant and beginning farmers), Minneapolis Public Schools Nutrition Center, and several other sites. This overnight tour will travel to New Sweden Dairy Farm, Children’s Museum of Southern Minnesota, U of M Southern Outreach Center (to see their pig and cattle facilities), Chankaska Creek Vineyard and Winery, and Farmamerica. Arnold’s Implement will be providing tractors and other implements for tour participants to drive at Farmamerica! 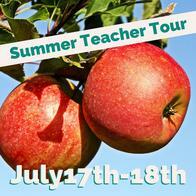 This is an overnight tour with a hotel stay in Mankato. More than 450 educators from around the country learned how to use agricultural concepts to teach reading, writing, math, science, social studies, and more at the National Agriculture in the Classroom Organization’s (NAITCO) National Conference June 20-23 in Kansas City, MO. 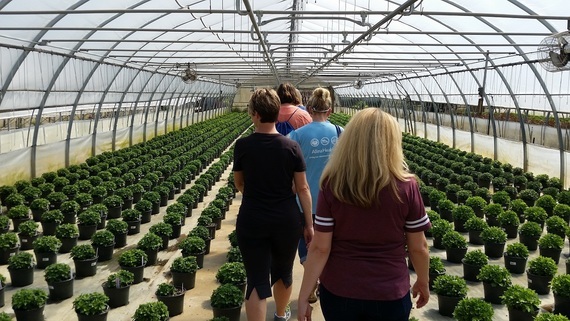 Conference participants went on traveling workshops of nearby agribusinesses and research facilities to learn about corn byproducts, grain production and the beef industry, and other topics. The conference keynote speakers included agriculture broadcaster Tyne Morgan, USDA/NIFA Director Dr. Sonny Ramaswamy, and Greg Peterson of the Peterson Farm Brothers who rose to fame by posting music videos about farming using social media. MAITC's Outstanding Teacher Award winner, McKenzie Gregory, a 5th/6th writing teacher at Rockford Middle School, was recognized on Thursday for her outstanding creative efforts in teaching students about agriculture. Kathy Guse, Farm Camp Director, was also recognized as a White-Reinhardt Scholarship winner. 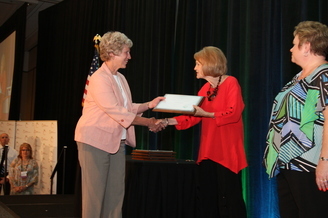 Kathy was selected to receive a scholarship to attend the conference based on her dedication to ag literacy. Among the many workshops offered, MAITC Education Specialists Sue Knott and Keri Sidle led workshops about specialty crops and agriculture on the sports field. 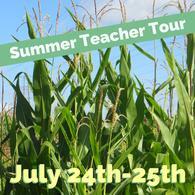 Next year's National Agriculture in the Classroom Conference will be held in Portland, ME June 26-29. Teachers who would like to attend but need assistance with the cost can apply for the competitive Farm Bureau White-Reinhardt scholarship in October. 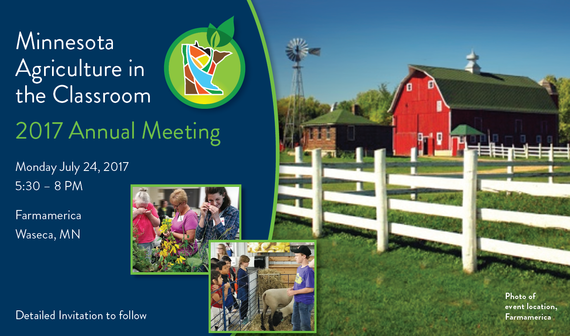 You are invited to the 2017 MAITC Foundation Annual Meeting. This casual event will provide an opportunity to highlight MAITC’s accomplishments over the past year and thank our supporters for their contributions in making these efforts possible. Approximately thirty kindergarten through twelfth grade teachers will be attending this annual meeting as part of MAITC’s Summer Teacher Tour. MAITC Foundation’s 2017 Outstanding Teacher Award winner, McKenzie Gregory, will also be recognized. Please join us on the evening of Monday, July 24, 2017 at Farmamerica from 5:30-8pm for a dinner celebrating MAITC and teachers. RSVPs are requested by Monday July 10th. 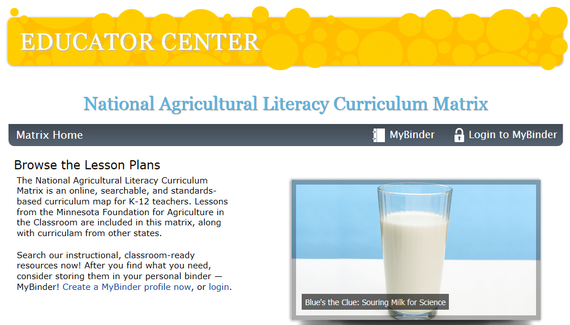 A great tool to use in planning and utilizing the Curriculum Matrix lessons is the MyBinder tool. MyBinder allows you to store lessons in a personal virtual binder and makes it easy to find the lessons again later. We would love to know how Minnesota teachers are using the MyBinder feature, so please send us an email sharing how you use this helpful tool. Last month's trivia question was, "How many cows are milked daily at Meadow Star Dairy?" The answer was 8500 cows. Ready for this month's trivia question? Here it is! What year was the first Minnesota State Fair held?